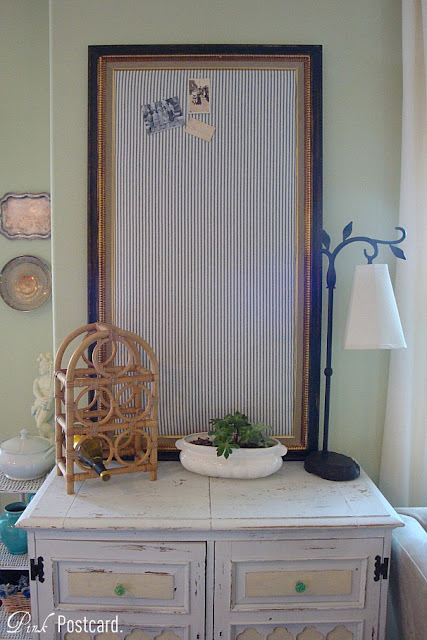 I'm breaking away from the bedroom makeover to show you another project I've been working on. This fun corner cabinet was something I picked up from a neighbor. I've been admiring it in their garage (!) for awhile now, and recently she called and asked if I'd like it. Things just hadn't panned out for the project they had in mind. Once I got the idea rolling in my head, it came together pretty quickly. 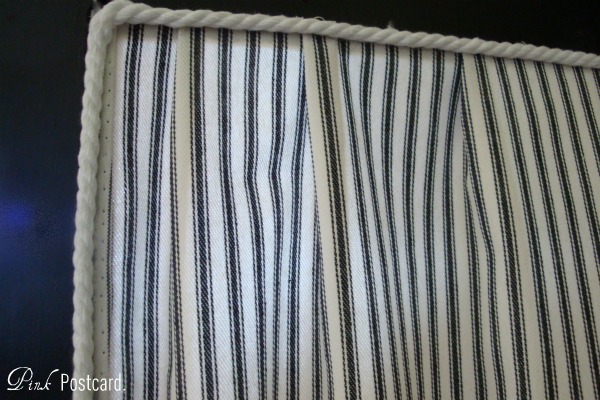 Removing the glass panels that were in the top portion, I added in some black and white ticking stripe fabric. 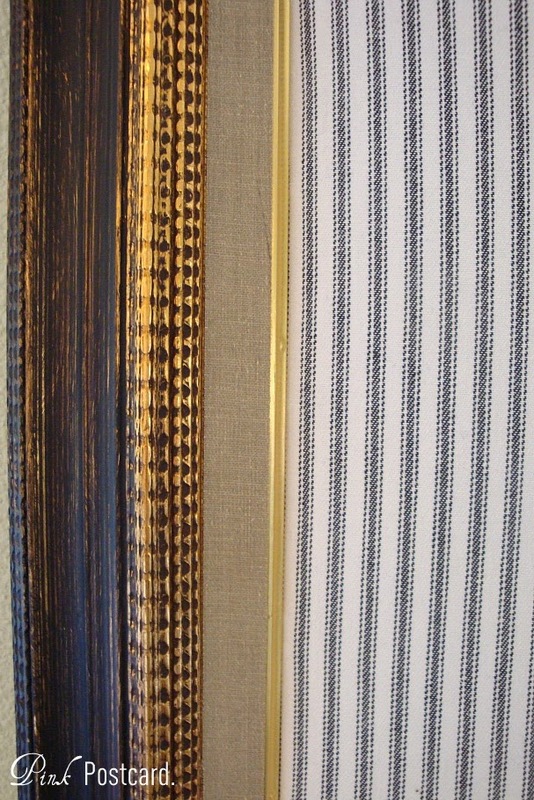 The inside is finished off in a white rope trim. I left the insides white, just for some pop. 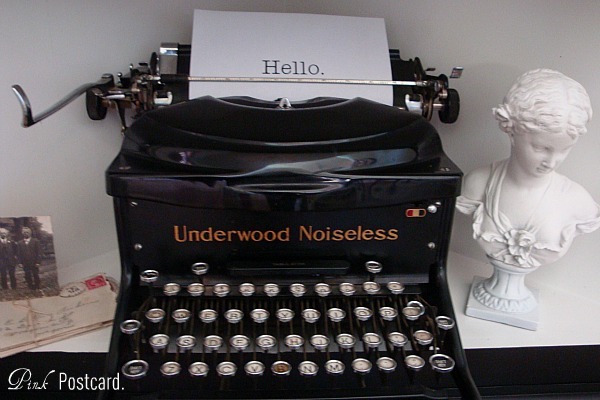 The vintage Underwood typewriter was a major find (thanks to my 11 year old- I seriously need to start paying her "finder fees"!!) ...and I knew I would be displaying these two together. The knobs are from Anthropologie- don't you love the graphic element it adds? The bottom knobs are oil rubbed bronze, and I wanted those to blend in more and have the highlight on top. Lots of fun storage with adjustable shelving. Loading it up to take down to the shop this afternoon! This whopper is a little over 4 feet tall! 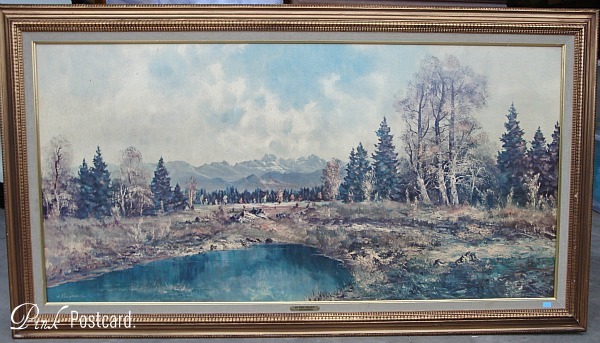 It started out as a very large framed vintage piece of art. I didn't care for the artwork, but loved the size of the frame! A little more black over some of the gold, and it looks great. Some more plans with the ticking in the near future- one of my wish list items will be making it's way home next week! Have a great Thursday- hope to see you tomorrow with the finished vanity bench. The ticking looks fresh and pretty! And isn't it great when people ask you to take away their furniture! ... And in case you missed it, we featured your shabby chic chair last week! 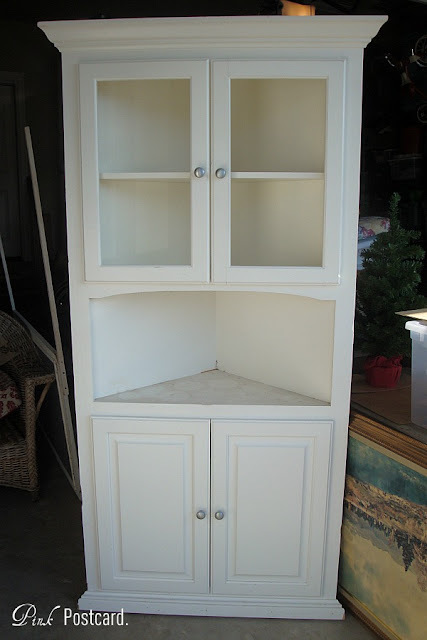 The "After" corner cabinet is so sleek and nice. I'm a fan of ticking too. I'm sure that will sell very quickly. What a score. 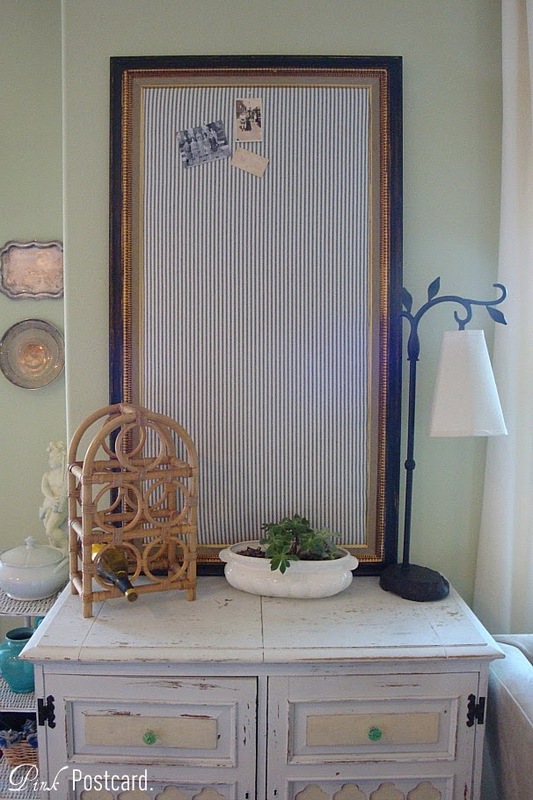 The corner cabinet looks amazing painted black and the ticking stripe bumps up the "WOW" factor. Wonderful job. 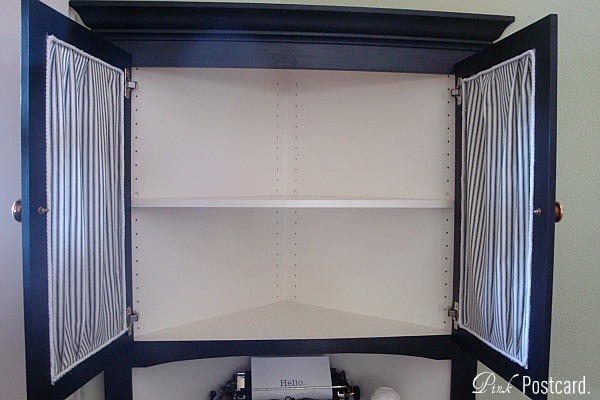 Great cabinet makeover, Denise! And the ticking pin board is awesome! I can see someone snatching them both up to create a great little office or crafting nook in their home! Nice work! See you tomorrow! Can't wait! Drive safe! I love this makeover! I have a similar cabinet that my grandfather built and never would've thought it could look so good painted black. Thanks for sharing! 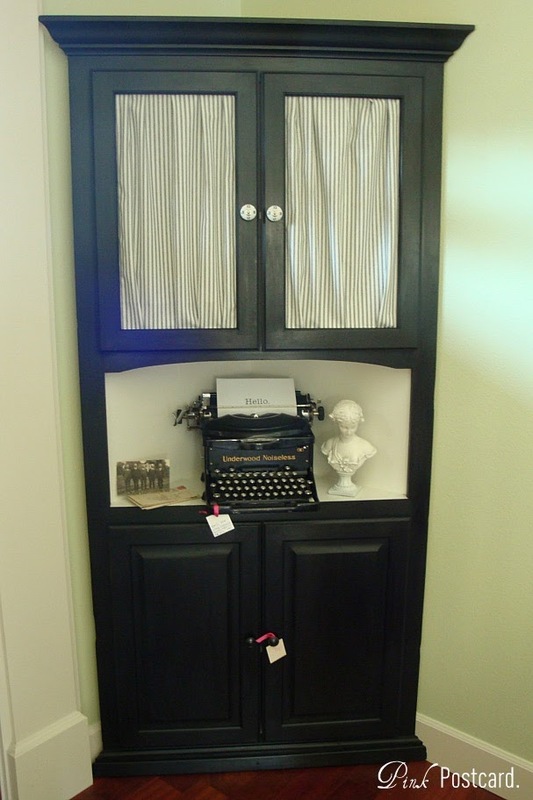 Love the corner cabinet and the typewriter! i just took an oldie to my booth too!! 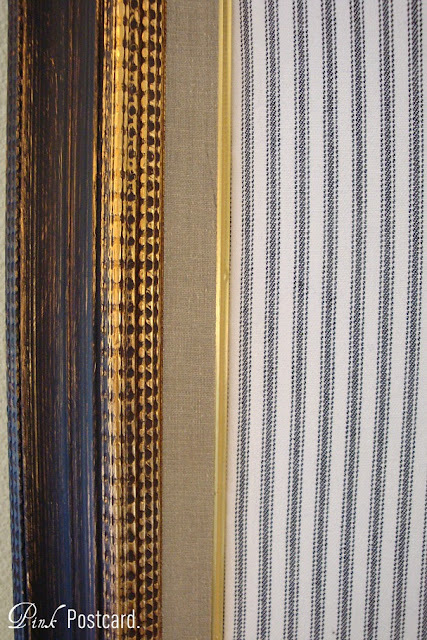 And of course I love the ticking stripe as well! so much fun! Happy Friday! Love the corner cupboard! Love ticking!!! Love it! 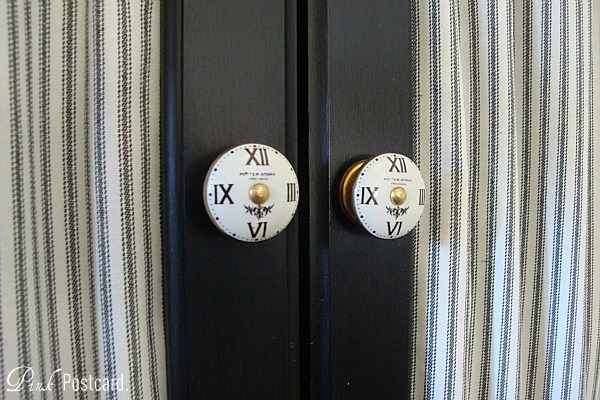 The knobs on fabulous! 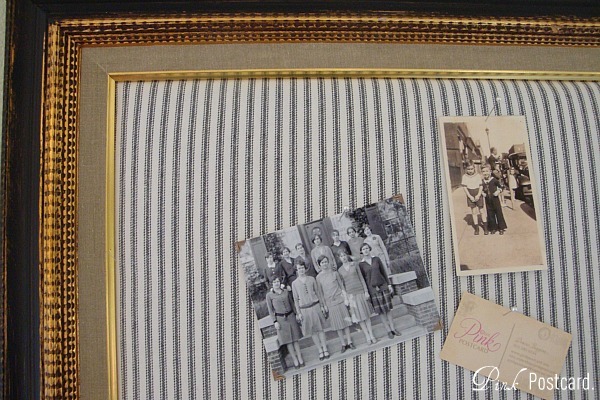 Love how you transformed the frame as well! *oops... the knobs *are fabulous! It was nice to meet you the other night as well. I had a great show and sold tons of stuff. Hope to meet up with you soon! Darn! I missed you. Would have loved to meet you - but don't doubt our paths will cross again soon!